You may have some encrypt PDF documents. While created password for these PDF documents, what we want is to protect our copyright. But sometimes, we need to reedit those PDF documents. Before editing, we need to decrypt these encrypt PDF documents. If you are hurry to do that, you should find a simple to use and fast way to decrypt the standard security PDF files. Batch PDF Decryption (A-PDF Password Security) is the tool for helping you batch remove or add password protection for PDF, easily and quickly. Batch PDF Decryption has the user-friendly interface. No matter you are a designers or new one, you can quickly add or remove the password for single PDF document. You can control who can open you document, who can print your document, who can edit your document. And the properties of encrypt PDF can be set as you need. Some people may have multiple similar PDF documents which need to be encrypted or decrypted. 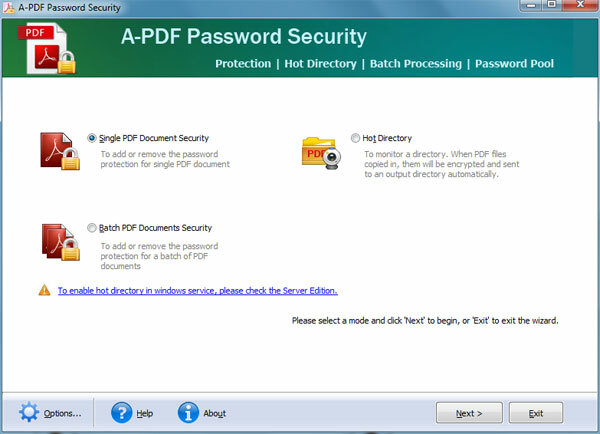 How to effectively add or remove password for multiple PDF files? You can use the batch PDF documents security feature which provided by Batch PDF Decryption. You can add or remove PDF files in the same time and then save them as separate PDF files. Set a monitored directory and then all files written in this directory will be encrypted and saved to output directory. Password Setting Rules: 40-bit RC4 encryption, which is supported by Adobe Acrobat 3.0 or above; 128-bit RC4 encryption, which is supported by Adobe Acrobat Reader 5.0 or above. Except for encrypt and decryption, you can also make the PDF expired in a certain date. When the date exceed, Adobe PDF will send the expired information for users.